This is my new nephew. 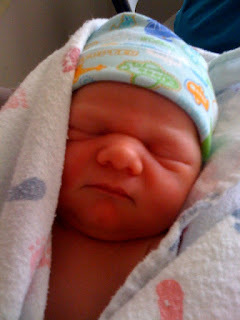 He was born on Wednesday, April 29th 2009 at 9:27AM. He is the sweetest, most innocent, beautiful baby I have ever seen. I was in love from the moment I saw him. My sister, Kelly, did an amazing job through her very tough delivery. I can't stop looking at him when I am with him. He is absolutely precious! I am SO excited to be AUNTIE Tracy!!! One of the best days of my life! congratulations to the new mommy and new auntie!!! what an adorable baby!!!! Tracy!! He's absolutely precious!! I can't wait to meet him!! Tell your family congrats for me. Miss you! SO ADORABLE, CONGRATS TO YOUR FAMILY! Tracy---you are such a precious resource to your sister and her new family. Thank you for keeping us all updated. Ryan is so beautiful, I'm in love and 7 hours away from him. Can't wait to see all of you soon. awww he's precious!! congratulations auntie!! !